(Newser) – MItt Romney assures us that his tax plan won't reduce the tax burden on the rich, but that claim leaves out a little-known divide between the wealthy and the super wealthy, writes David Frum at the Daily Beast. He says Romney's plan to make cuts in the top income-tax rate would be a boon for the richest of the rich, while the closing of loopholes and deductions would force the "ordinary rich" to pay the difference. 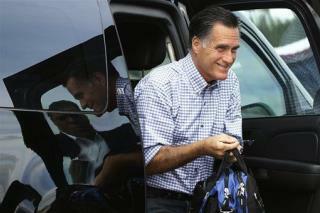 In other words, "Romney would transfer the tax burden from the plutocrats to the orthodontists." So, are y'all voting for him now? An Analysis of Romney's Tax Plan By the "Tax Policy Center" shows: 1. PEOPLE MAKING OVER $1 MILLION RECEIVE HUGE TAX CUTS: $1 million = $83,000 tax cut $5 million = $166,000 tax cut $10 million = $830,000 tax cut $50 million = $1.66 million tax cut. Average tax cut for people making more than $1 million is $175,000. 2.THE MIDDLE CLASS RECEIVES A BIG TAX INCREASE. Romney's plan increases middle class taxes by an average of $2,007 a year. 3. TO MAKE IT REVENUE NEUTRAL HE HAS TO RAISE TAXES ON THE MIDDLE CLASS. Romney's plan reduces Revenue by $360 billion per year and would increase the debt by $4.4 trillion Over 10 years. Romney has promised to make the tax bill revenue neutral by eliminating loop holes, but he has made many loop holes for the rich off limits. That means Romney will have to cut tax benefits that effect the middle class more than the rich. These include Mortgage Interest Deductions, Exclusions for Employer for Health Insurance, etc. In other words, he has to shift $86 billion in taxes away from the Rich and put them on the Poor and the Middle Class. This is what it looks like: Bottom 20% = $720 tax INCREASE. Next 20% = $1,166 tax INCREASE. Middle 20% = $2,007 tax INCREASE. If it's going to soak the 'ordinary rich', it's going to kill the rest of us.